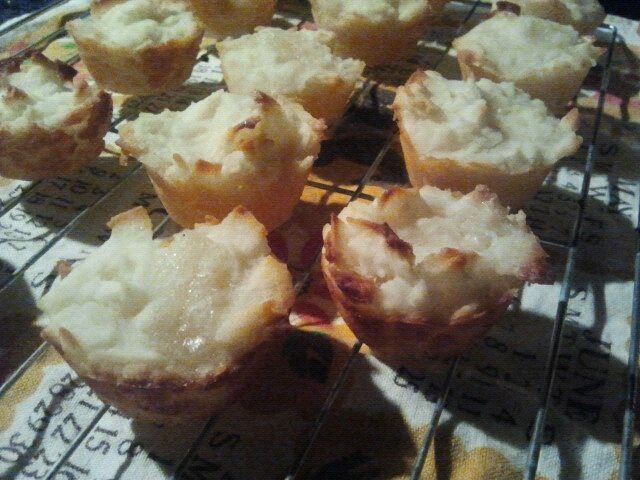 Tasty little gluten-free vegan coconut macaroon mini muffins! 1. Preheat oven to 375 degrees F (190 degrees C). Spray mini-muffin pans with cooking spray. 2. Mix together the coconut milk, honey/agave and vanilla with the water in a mixing bowl. Stir in white rice flour, coconut, and salt. Spoon the mixture into the prepared mini muffin cups, and sprinkle with sugar if desired. 3. Bake in the preheated oven until the tops are golden brown and crusty, about 20-30 minutes. thanks to DelishD. for introducing me to the general idea for these, from a Malaysian recipe!